Oh goodness, this is our second Top Chef Just Desserts Elimination Challenge … Challenge! On the last episode of Top Chef Just Desserts the cheftestants were challenged to create bake sale goodies. I love bake sale goodies, as my thighs will attest, so I was all in on this one. Bake sale treats are meant to be homey, but that does not mean they are simple. Since the air has suddenly become crisp (I know it can’t last, it is Texas) I felt an autumnal baking urge! I wanted something hearty, earthy, complex, and decidedly for the fall. That left me with only one available option here in Texas. Sweet potatoes! 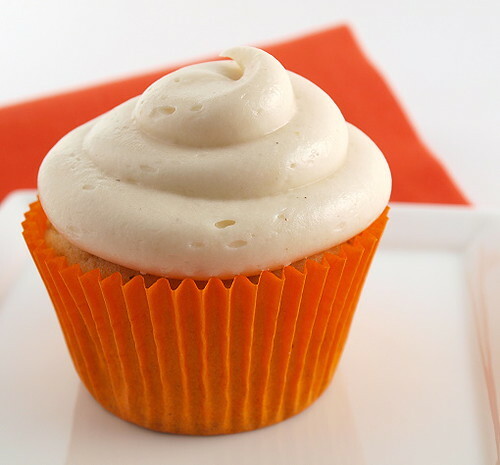 These cupcakes remind me of sweet potato pie but better because they have frosting. 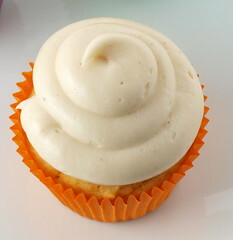 I did not add a lot of spices to these cupcakes, opting for cinnamon and a little allspice. Sweet potato has a delicate flavor that is easily overpowered by too much spice, but if you want to add other flavors you can. 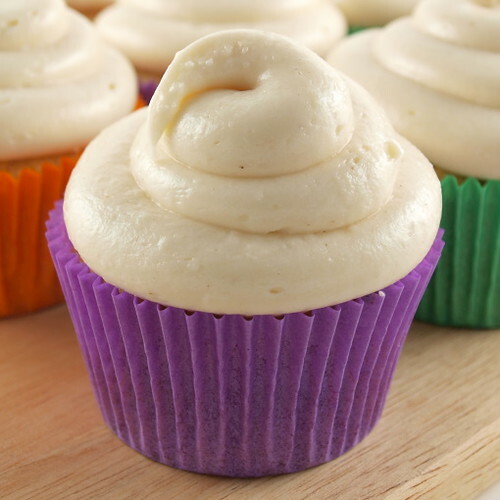 By far, the frosting is my favorite part of these cupcakes. It tastes like tangy toffee, which sounds strange until you actually taste it. 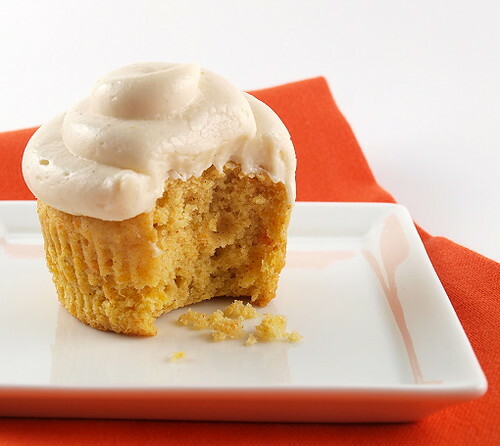 Combine the frosting with the sweet potato cupcake and you have a treat worthy of any fall party or get together! 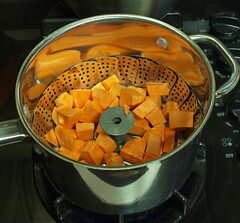 Steam the sweet potatoes until fork tender, about ten minutes. Set aside to cool slightly then mash with a fork until smooth. 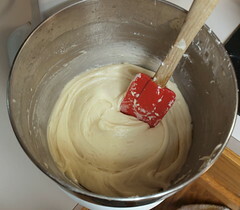 In a medium bowl cream together the butter and sugar until light in color, about three minutes. Add the egg, sweet potato, buttermilk, and vanilla. Mix until well combined. In a large bowl sift the flour, spices, baking powder, baking soda, and salt together. 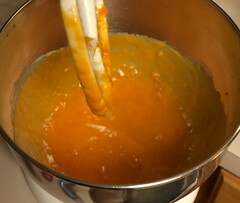 Pour the wet mixture into the dry and whisk until no large lumps remain. Do not over-mix. 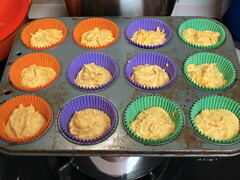 Divide the batter evenly between the baking cups. Bake for 18 to 20 minutes, or until the cakes are golden brown and spring back when lightly pressed in the enter. 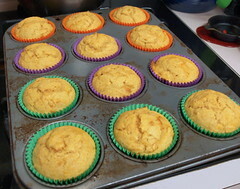 Cool for three minutes in the pan then remove the cupcakes to a wire rack to cool completely. 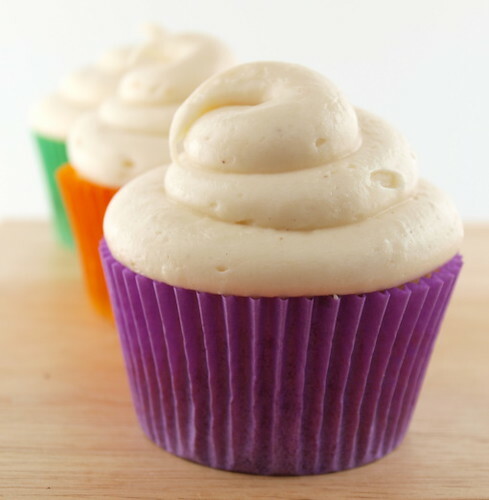 While the cupcakes cool prepare the frosting. 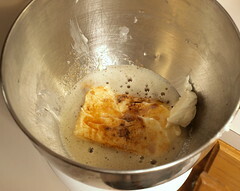 In a medium bowl cream together the cream cheese and browned butter until well combined. The mixture may look slightly curdled. Add the vanilla, cinnamon and powdered sugar and mix until smooth. Time for the Round-Up!! So, what other bake sale goodies would our Just Desserts Elimination Challenge … Challenge participants be selling?? My friends over at the pêche would be selling some yummy looking Peanut Butter Crispy Bars! Pretty sure those would sell out! Marye from The Restless Chipotle is going to tempt our taste buds with Fluffernutter Whoopie Pies. How could you say no? Fun As We Go has some spectacular Raspberry Bars on offer … made with fresh raspberry filling! Oh my, yes please! Lara from Food. Soil. Thread. made Zucchini Coconut Bread that would have me spending my money! The Twisted Chef may be breaking the law with Salted Caramel. Seriously, it should be illegal it sounds SO good! Renee at Flamingo Musings made some sinful looking Pumpkin Rocky Mountain Brownies! Those look absolutely killer! The folks at Bravo were kind enough to recommend a sneak preview of the next episode! Check it out below! I can’t wait for the next challenge! See you next week, and if you want to participate just email me the link to your Elimination Challenge inspired post no later than 9am CST Wednesday morning.